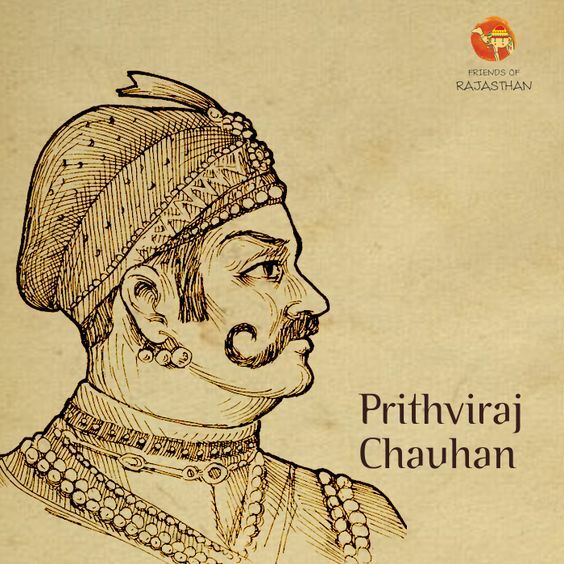 Inscribed in the pages of the great Indian history for his military conquest, resilience, and bravery even in the eyes of defeat, Prithvi Raj III, popularly known as Prithviraj Chauhan or Rai Pithora in the folk legends, was a king of the Hindu Chauhan (Chauhamana) dynasty. He ruled the kingdom of Ajmer, the capital of Sapadalaksha which was traditional Chauhan territory till the latter half of the 12th century. Where he had the flags of the Chauhan dynasty hoisted proudly in much of the present –day Rajasthan, Haryana, and Delhi; and even some parts of Madhya Pradesh and Uttar Pradesh. Though traditionally the king of Ajmer, the medieval folk legends describe him as the king of Delhi and portray him as a representative of the pre-Islamic Indian power. 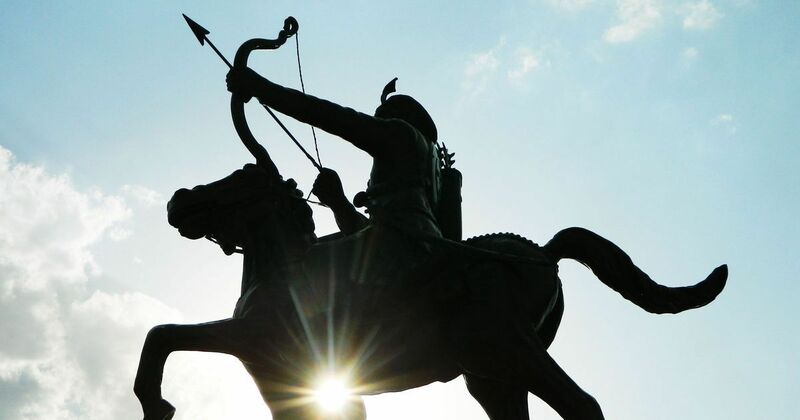 Prithviraj Chauhan was one of the last independent Hindu kings who ruled the kingdom of Delhi. Prithviraj was born to the King Someshvara and queen Karpuradevi of the Rajput Chauhan dynasty in 1166 CE. As the legends have it, the Agnivanshi Rajputs, the clan Prithvi Raj belonged to, derived its origin from a sacrificial fire-pit. When his father died in 1177 CE, he was only 11 years old, still a minor, he ascended to the throne with his mother ruling the kingdom as a reagent. According to the ancient scriptures, the Prithvi Raso in particular, he is said to have assumed the actual control of the administration in 1180 CE. A king whose reign separated the two major epochs of Indian history, Prithviraj, in the pages of the Indian history, has been portrayed as a patriotic Hindu warrior who fought against Muslim enemies unifying all the Hindu Kings against the Muslim foe. Though factually incorrect, he has left behind the legacy of ‘the last independent Hindu King of India’’, clearly in the later centuries, there were many Hindu kings who flourished in the Southern part of India. The first military achievement of Prithviraj was his suppression of a revolt by his cousin Nagarjuna and recapture of Gudapura (possibly modern Gurgaon). Nagarjuna was a son of Prithviraj’s uncle Vigraharaja IV, and the struggle for the Chauhan throne had led to a rivalry between the two branches of the family. It was also early in his career, Prithvi Raj achieved military successes against several neighboring Hindu kingdoms, most notably against the Chandela king Paramardi. As the tales have it, Prithvi Raj was returning to Delhi after marrying the daughter of Padamsen, when his contingent was attacked by the Turkic forces (Ghurids). His army repulsed the attacks but suffered serious casualties in the process. Amid this chaos, the Chahamana soldiers lost their way, and unknowingly encamped in the Chandela capital Mahoba. They killed the Chandela royal gardener for objecting to their presence, which led to a skirmish between the two sides. A harsh battle was fought with a valiant show of forces from either side and at the end of the battle, Prithvi Raj had another conquest to his name. His other minor victories include the Conquest of Kakuda kingdom, the battle against the King of Dariyagarh and against king Raichand to name a few. But had only a single battle to be inscribed of Prithvi Raj in the pages of the history, it would be the battle against the ruler of the Muslim Ghurid dynasty, Muhammad of Ghor, the Battle of Tarrrain. In 1191, Muhammad Ghori, leading an army of 120,000 men, invaded India through the Khyber Pass and was successful in reaching Punjab. Shihab ad-Din, also known as Muhammad of Ghor, captured a fortress, either at Sirhind or Bathinda, in present-day Punjab state on the northwestern frontier of Prithvi Raj Chauhan’s kingdom. He led two regiments in an attack on the center, where Shihab ad-Din met Govinda Raja in personal combat. As the battle continued, Ghori’s army, exhausted in face of the persistent Rajput attacks and out of the water, fled leaving their general Muhammad Ghauri as a prisoner in Prithvi Raj’s hands. It was where the coins flipped and the course of history was changed, Prithvi Raj against the advice of his courtiers pardoned the aggressor respectfully released the vanquished Ghori. In 1192, Shahabuddin Ghori reassembled an army of 120,000 men and returned to challenge Prithvi Raj at the Second Battle of Tarain. When he reached Lahore, he sent his envoy to demand surrender but Prithvi Raj Chauhan refused to comply. Despite having no allies, mainly because of the rivalry between the Hindu Kings, Prithvi Raj assembled a very large army which is said to have consisted of elephants, horsemen, and considerable infantry. Shahabuddin Ghori divided his troops into five parts and attacked in the early morning hours, sending waves of mounted archers. After a day of a heavy casualty of the Chauhan army, at dusk, Shahabuddin Ghori himself led a force of 12,000 heavily armored horsemen to the center of the Rajput line, the Rajput army broke ranks and fled, Prithvi Raj attempted to escape but was captured. Prithvi Raj was taken to Ghaur and imprisoned there. Some accounts have it that Prithvi Raj was blinded by his eyes being burnt. Even there, in the eyes of the death, he did not accept the supremacy of Ghauri. As the tales have it, once a contest was held for Prithvi Raj to demonstrate his archery skills. Also, present on the occasion was Chandravardai, the poet and an old friend of Prithvi Raj Chauhan. Chandrvardai sang a directional song as thus giving away the location of Ghauri in the assembly. The shackled Emperor then shot the arrow in the indicated direction which hit Ghauri causing this eventual death. Chandravardai then killed Prithvi Raj and then himself. It isn’t just the thrilling military conquest and the fierce bravery, the legend Prithvi Raj is admired for. 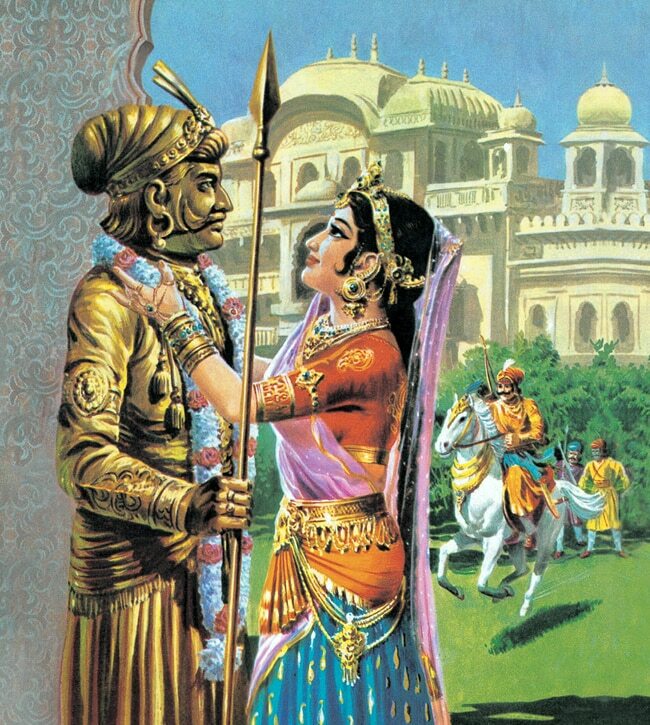 The romantic tale of his love affairs with Samyukta (Sanyogita), the daughter of Jai Chandra Rathod, the Gahadvala king of Kannauj melts the hearts of many. However, the legend of a king, Prithvi Raj Chauhan was indeed one of the greatest rulers the whole of India ever had.